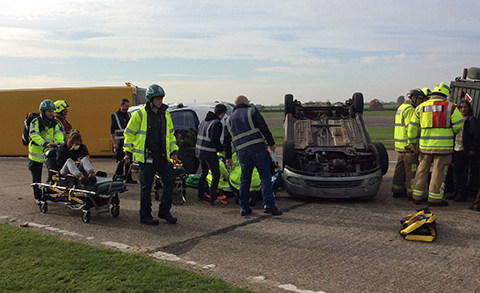 Several SERP partners were involved in a recent training exercise to test how agencies can most effectively work together to tackle a large scale, multi-casualty road traffic collision. 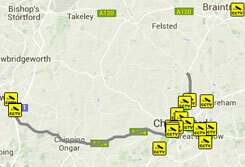 The exercise was led by the Helicopter Emergency Medical Services (HEMS) team of Essex & Herts Air Ambulance Trust (EHAAT). Various agencies from the eastern region’s emergency services* participated, including SERP partners Essex Police and Essex Fire & Rescue Service. 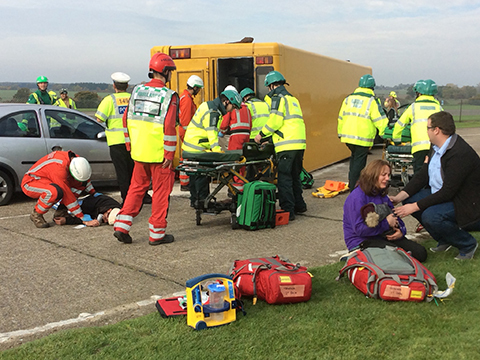 The exercise was set up on North Weald Airfield near Harlow, to recreate a multi vehicle incident on the M25 involving cars, heavy goods vehicles and a loaded horse trailer. PCs Laura Shelley and Garry Stansbie, from Essex Police Roads Policing Team, were first on the scene to discover more than 60 casualties requiring attention. Students from Anglia Ruskin University, University College London, St Bartholomew’s Hospital and The London Medical Schools acted brilliantly as distressed casualties desperately awaiting rescue. The presence of the horse trailer added an extra element to challenge the teams involved to think how they would cope with an unexpected element. PC Laura Shelley said: “Training exercises like this enable us to learn how to work with other agencies in order to best respond to multi-casualty scenarios. Ben Myer, Clinical Manager of EHAAT, said: “It is not until we are tasked to multi-casualty incidents that we know how we will react or manage these situations. Footnote: Other agencies and organisations involved in the exercise included Urban Safety & Rescue (USAR), East of England Ambulance Service Trust’s Hazardous Area Response Team (HART), BJG Heavy Rescue, BASICS Essex Accident & Rescue Service (BEARS), British Animal Rescue and Trauma Care (BARTA) and The Household Cavalry Mounted Regiment.